If you’re feeling a bit bored at your computer, you could be using your downtime to help science. All you need is a computer with a working internet connection and you too can help solve scientific mysteries. 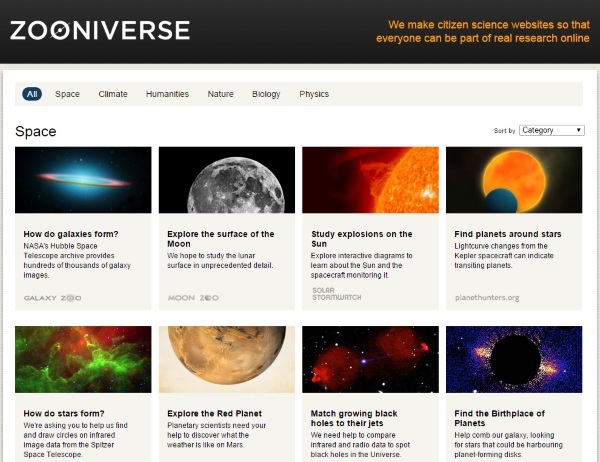 Zooniverse is a website that allows people to take part in crowdsourced science. Some science has a great deal of data to sort through in order to help find any sort of answers. Like, a lot of data. Slides of cells, photos of galaxies, animal sounds. Data that you may not actually need a degree to sort through. Instead, you just have to be able to tell the difference between a set of colors or shapes. Easy stuff. On the site, normal people cam shift through this massive amount of data so the scientists don’t have to. The crowdsourced projects cover everything from cancer research where you can identify abnormal cells (after being taught which are which) to identifying bat calls. Basically all branches of science could use a little bit of help from time to time. Zooniverse is a free website.